4:13 Strong operates under the simple and powerful belief that every man deserves a chance to do great things. We believe every man in Nashville should have the opportunity to succeed, regardless of his circumstances. We provide that opportunity. 4:13 Strong’s intensive, 6-month residential program uses vocational, life and spiritual training to equip men to transform their lives. No matter what their past has held, we equip each man with the skills he needs to start a career, gain financial independence, and be the man of character God created him to be. To apply for the program, participants must complete a week of physical and mental conditioning we call “Mental Toughness Week.” Men are put to the test with a series of challenges that will push them outside of their comfort zones and test their character under pressure. If a man makes it through this week and an interview process, we know he has what it takes to complete the program and make a better future for himself. Men in the program are removed from their toxic environments and live together in dorm-style housing. They share the responsibility of doing chores and cooking dinner, and follow a strict schedule. It’s a safe environment for learning and practicing community and self-discipline. 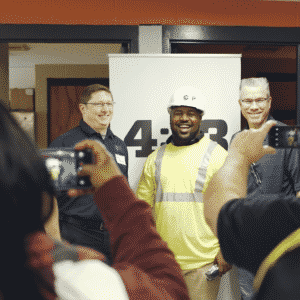 During the 40-Day Challenge, men spend five or more hours in the classroom each day, where they participate in financial literacy, work readiness and construction skills training classes, as well as Bible study. The men visit multiple job sites, and earn three construction-industry certifications. Every weekend during the 40-Day Challenge, men participate in a service project or adventure outing to give back to the community and challenge themselves. Equipped with the right job skills, our men are usually employed full-time after just eight weeks in the program. With a steady paycheck and a new mindset, the men work toward buying a car with cash and saving an emergency fund. The process gives them the confidence to clearly see the path to standing on their own two feet. 4:13 Strong relies on the generosity of the Nashville community to achieve our mission of breaking the cycle of poverty, crime and dependency. If you have time, talent, financial resources or job openings, we need your help.